I am excited to have you. I have signed up with 1Password. I am a design professional with computer (and coding) experience, but not a programmer. I want 1Password to securely manage my passwords. This is my first time with 1Password, and I want to use to use all my Apple devices and iOS devices with 1Password. However I have been using passwords for years, so they are in iCloud (except for banks sign-ins which are not saved in iCloud). This (see image #1 below which I cut and pasted from the above link) is NOT what I see in my Preferences pane. I have downloaded 1Password 7 — this is not the Preferences Pane in the 1Password7 that I downloaded. There is NO SYNC icon (or option) at all. See the screengrab that I made, Image #2. All my passwords are in iCloud - I simply want to add 1Password security (Watchtower/ insecure passwords) PLUS the ease of iCloud across all devices. Coding is not my job, and I am too busy to code - I just want this to work. The thing is that if you have a subscription then syncing of your account is automatic through 1password.com, and so you don't have a sync option in Preferences. If you have a stand-alone licence then you have to manage syncing yourself and have various options in the Sync tab of Preferences. If you have a subscription and have a Primary vault, then that is outside your account, and you have to sync it yourself; however, the Primary vault only exists when you have moved from a licence to a sub, and the intention is that you should remove it once everything is fine with the sub. I'm not sure of the best way to get your passwords from iCloud into 1PW, but take a look at the converters created by @MrC ; he probably has one that works for this. I'm having a lot of challenges and starting to wonder if it's worth the time I've been investing to get this working properly. I also just put in request for support and sent them a diagnostics report. I don't want to appear stupid, but I completely don't understand. I've only been reading about 1Password for 3 days, and the basic sign-up information is skimpy; more like an ad rather than instructions and troubleshooting. "If you have a stand-alone licence then you have to manage syncing yourself and have various options in the Sync tab of Preferences. If you have a subscription and have a Primary vault, then that is outside your account, and you have to sync it yourself; however, the Primary vault only exists when you have moved from a licence to a sub, and the intention is that you should remove it once everything is fine with the sub." I had to do some looking to @MrC , then another search to find his converters. (https://discussions.agilebits.com/discussion/30286/mrcs-convert-to-1password-utility/p1) . However, as I'm not trying to be a programmer, I don't have time to figure out all the details of "Stable bits" or "Testing bits" and I have no idea what this is. Is there an easier option for those of us who have other work to do rather than coding? "Sub" is short for "subscription". I'm afraid I just took it for granted that everyone knew that. "Subscription", "membership", "account" all mean (almost) the same thing. The options are subscription, which covers all platforms and all updates (and has other advantages) or licence, which covers only one platform and only minor updates. For newcomers, AgileBits recommend subscriptions; licences are available partly for users who started with a licence before subscriptions existed and want to continue as they were and partly for those who don't want to subscribe for one reason or another. While AgileBits staff do respond to every support request, they are still getting so many requests that they may be slow in replying. One advantage of asking in the forums that experienced users may be able to give the support needed faster than the official reply from AgileBits. @danco : I signed up -- "for a subscription" (?) and provided a credit card. It's my understand that as an intended paid member, I should have all features. But with the "30 days free", perhaps they expect me to drop out and therefore not want all the features...? I tried to ask Agilebits in advance what would be the best plan for me, but they never replied. So I thought they'd reply if I 'bought a subscription'; ie: paid, instead of being a freeloader. Do you have better advice for me? ; ie: how to manage security across all my Apple devices (iMac, iPhone, 2 iPads, an occasional Macbook pro) -- I don't have any sync options how to convert my iCloud to 1PW, as my first post stated. I'm not stupid, but it's starting to look that way in this software forum. You'll have to decide which 1Password basis you want to use - Subscription based (their recommended choice), or a Standalone License. So now, I want to clarify the "iCloud" fuzziness here. With the Standalone License, you have the option to sync your 1Password data using iCloud as the cloud storage, so that your other 1Password devices can sync. (this option is not possible with the 1Password subscription, as @danco explained). Regardless of your choice of 1Password (Standalone or License), you both appear to have some web login data in Apple's iCloud (keychain). This is done for you by Safari when you log into sites (when you have that option enabled on your iDevices/Macs). 1Password has no access to this iCloud data. It belongs to Safari and and Apple doesn't make available a way to get this iCloud-stored data. That said, and what danco was referring to, there is a way using a Mac, to get that data out of Safari, and into 1Password. This I can help you with, and you don't need to program anything. If/when you are interested, let me know and I'll be here to help (the process is rather easy). Thanks for your reply - but there is not two (2) options for signing up. Just 1 option: $2.99/mo for individual (https://1password.com/sign-up/) . There is no Standalone option. At all.... unless it's hidden. I would be HAPPY to use a Standalone License ("you have the option to sync your 1Password data using iCloud as the cloud storage, so that your other 1Password devices can sync.") HOWEVER that was NOT what 1PW has on its pages for new customers. I would be happy to learn about your "Mr.C Method" . I taught myself almost every software I learned, ever, including coding HTML by hand starting in 1995; I thought 1PW was simply WYSIWYG. PS to @MrC : I do have 1 PW 7 (1Password 7 Version 7.2.4 (70204000) AgileBits Store) . Is this the standalone? I'll take whatever help I can get. I'm available now. I'm so confused now, even more so. For the standalone license, you'll have to get in touch with Agilebits. They do not actively promote this model, but support it. They read these forums of course, and someone from the team will follow-up with how to move forward. I don't have an answer for you regarding your AgileBits store v7 - I haven't had to think about the various versions of 1Password in years, so I'm rusty here. Lars explains more and see this thread and downwards. I'll sidestep the issues regarding the marketing materials, sign-ups, etc. and focus on getting your Safari data imported. Let me suggest, that you post a very quick note in this converter suite thread. This way, we can let your thread here sit and wait for the 1Password team to address. I think its best you get sorted out your usage first, and it sounds like that's a standalone model. Let the 1Password folks guide you. Please see my post above first. You will save yourself time and frustration if you get your basic usage of 1Password squared away first. Thanks MrC. I trying to figure the basics out on my Mac first but I have a long way to go, Nothing seems to be working quite like it should and I've invested more time than I thought i would need to already. Just not sure which direction to go next. I sent support a diagnostic report and I guess I'll just wait to hear back. Thanks again. Welcome to the forum, @Lauren_heythere! I'm sorry for the delay in our reply here; we have a smaller staff on the weekends, and so even though we're several posts deep into this with replies from not one but two of our awesome community moderators, I do apologize we haven't had a staff person reply to you yet. At any rate, here I am, better late than never. You sign up for an account at the main 1Password sign-up page. Your subscription includes the 1Password apps across all platforms, with all updates and upgrades for as long as your account is active. Once you sign in to your account in 1Password on a new device, all of your data is instantly available - no need to set up third-party sync. You purchase licenses for each platform separately. These licenses include all in-version updates, but a major version upgrade (such as 1Password 7) may require a paid upgrade. 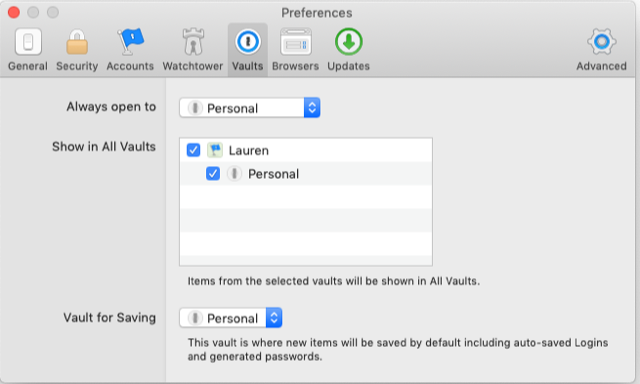 You create local 1Password vaults, and if you like, choose how to sync your data. You can set up sync using a third party service (like Dropbox or iCloud.) If you do not set up sync, your data will remain only on your device. 1Password accounts also include access to your data via a web browser, and per-item backups so you always have a safe copy of your data off of your devices, and can roll back to a previous version of an item if a change is accidentally made. If you've been using Safari as your password manager, then you'll need to convert those passwords as MrC mentioned -- and you'll be in excellent hands there. If you prefer a standalone license, you can do that instead of the 1password.com account/membership you signed up for. Can you let me know which way you'd like to go in that regard, or, if you're still not certain, ask any remaining questions you might have? Thanks. @Lars - Thanks for your reply. I also finally received a nice reply from Greig at 1Password (in Scotland) offering on email too. NOTE: I don't want to code (anymore) - I'm too busy. I looked at MrC's tools and it seemed like a rabbithole that I don't want to get into. Is this possible with a 1Password account (not the standalone)? Apologies for being so thick. I run my own business, which has travel; as well as work part-time on a volunteer basis for an international non-profit, which also has travel. I also run a household. I have many moving parts. I cannot afford to ruin any settings or do any more coding. There is no coding involved - you download the package, run the AppleScript, and you import the resulting 1PIF file into 1Password. Done. The only way to get (part of) your 1Password data back into the iCloud Keychain is to enable Safari's saving passwords, and visit each site. Safari is responsible for saving your credentials into a keychain, local or iCloud. There are other scripts in the wild that can help bring items into the macOS local Keychain. Right. Because iCloud Keychain doesn't offer any native importing or exporting options the ability to work more seamlessly there is severely limited. Currently what MrC has outlined is the only way to handle iCloud Keychain data. 1Password membership, which includes 1Password 7 for all compatible devices, covers the rest.